Also at Flashbak this week, I recalled the golden age of the Signet Best of Trek Compilation Books. “This week, as part of my continuing celebration of Star Trek’s 50th anniversary, I want to remember another tradition in print from the series history: Signet’s “Best of Trek” compilations. 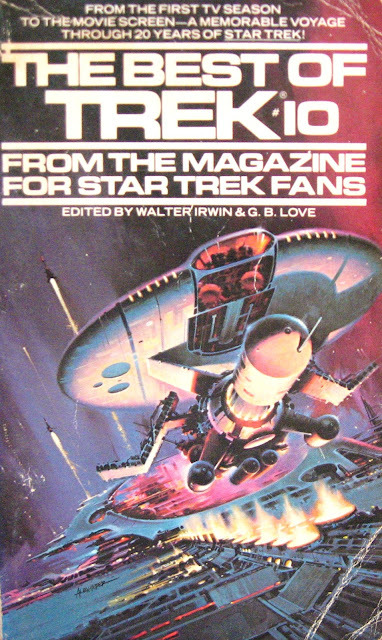 For those who may not recall it, Trek was a long-running Star Trek fan magazine edited by Walter Irwin and G.B. Love. Each magazine issue featured interviews, episode retrospectives, speculative articles about the Trek Universe, and even critical analyses of stories. The Best of Trek compilations were actually truth in advertising. They included -- between covers -- some of the finest pieces featured in the magazine’s run. And the cover art, as you can see from the illustrations accompanying this article, were glorious. They weren’t exactly Star Trek but more like a coherent variation on Star Trek, featuring amazing-looking, highly-detailed space craft and planets. I still own many of my Best of Trek compilations, and still pull them out, occasionally, for a re-read. "The Klingons: Their History and Empire" (Best of Trek 1), is one piece that I really enjoy, though its speculation doesn’t track (or trek?) with modern continuity about this warrior race. Also, I remember very fondly reading Best of Trek 3, which was the first compilation book following the release of Star Trek: The Motion Picture. I remember reading "Parallels in Star Trek: The Motion Picture vs. The Series" and fan reviews of the divisive film. Some fans loved it and some hated it. By the time of Best of Trek #15 in 1990, The Next Generation -- the first and still most popular of the spin-offs -- was being debated in essays such as "Same Sexism, Different Generation."